Find what kind of camping equipment for motorcycle you may need? First of all - camping tent! It is well known that every biker likes travelling, and if you are one of them who beside travelling enjoy camping as well, then you should seriously start thinking of getting yourself a motorcycle camping tent. These types of tents are especially practical when you are not in a mood to look for a hotel room or a cabin to stay. When you have a motorcycle camping tent, your vacation will be much easier and more interesting. Motorcycle camping tents are lightweight, they set up easily and store compactly for easy transportation. They are very functional as they provide not only privacy at campgrounds for changing clothes and sleeping but also they serve as shelter from storms. Usually motorcycle camping tents are made out of waterproof materials. 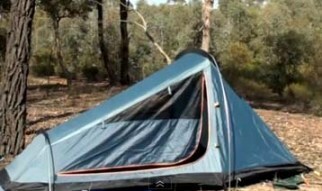 Some of them are made with aluminum poles which make them more heavier than tents made with graphite or nylon poles although the aluminum poles are more resistant to splintering. When you decide to equip yourself with motorcycle camping tent you must pay attention to some details. A good tent should include a rain fly, side-entry doors and a waterproof floor. Sometimes it is good idea to buy a ground cover for underneath the tent. Biker Tent is designed to perfectly match to the motorcyclists who really enjoy camping. This type of tent is good because it provides overnight shelter for the biker and his motorcycle as well. It is small, ultra light tent consisting of two compartments. One part of the tent is for sleeping and the other one is for parking the motorcycle. A zipper flap divides these two parts, so a camper can easily go from one to another compartment without going out. It can be packed to a very small size in order to be transported easily. Sportz X-treme Pac Tent is a compact, quality tent excellent for bikers and camping enthusiasts. It is portable, cozy and easy to set up motorcycle camping tent that can be adapted to any outdoor activity meeting your travelling needs. When it comes to buying a motorcycle camping tent you should consider some tips like choosing the size that can easily accommodate the number of persons because they are usually meant for 1 or 2 persons. Also weight of the camping tent is very important. When choosing a camping tent for your motorcycle pick one that is smaller as they are usually light and easier to pack on the motorcycle. Assembly is another important factor, which you have to take into consideration when buying a camping tent because after a long day of ride you will want a tent that assembles quickly and easily. At the end the fabric is very significant. Choose fabric that is light and durable. When you have considered all these factors, buying a motorcycle camping tent will be a great pleasure and your trip will be very enjoyable. The camping instruments for motorcycle are preferably the same as that of the back-pacing and climbing instruments. They are light weight and takes up a very small place for packing. The package actually remains very small and can be carried with ease. It has to be kept in mind that the equipment carried on a motorcycle tour needs to be light weight so that they can be carried easily. The most important being the tent. The tents are available in different shapes and sizes and are usually light weight. They are especially designed to ensure that they can guard a person against the odds of the weather. Some of the tents can also accommodate up to 8 people as well as the motorcycle. The ultra-light mattresses and the self-inflating air mattresses ensure that the person sleeping on them are kept safe by insulating them from the ground. This provides optimal comfort and keeps away the cold coming up from the ground. The insulating mat ensures that the body heat of the person is reflected back upwards and thereby keeps off the ground chill. The robust but yet light weight cooking sets made out of high quality stainless steel ensure that you feast out with ease and fun. The insulated mugs ensure that your drink is also kept at a correct temperature at a longer period of time. As far as the camping equipment for motorcycle is concerned, it is very important to ensure that the package that a person carries has all the necessary things in place but at the same time they are portable.